How are you all holding up? Yikes, I'm having a busy week, but its definitely a good one. Hope yours is too. Alrightie, let's get to it - Red-ish.....Well, the color here is almost red yet a little off, right? There seems to be a tad of orange on these or maybe we should just call it burnt orange? Anyhoot, I am in love with all these beautiful and expensive things (which reminds me I was thinking of alternating this series with a similar one called Affordable Adorations featuring more affordable items, yes? Let me know if you agree). Sorry, back to the topic at hand. If you have been following me for a while you know how much I love this Clarence House Fauve fabric because you know this is the fabric I have for my headboard as well! (see here. Its the last photo). So, naturally I'm loving this version in red. I chose this fabric when I was putting together our home as newlyweds because I associated the trees to good vibes, like health, peace, love, vitality, and fertility.... and am not even superstitious but the print just felt so positive...and of course its beauty had a lot to do it with it as well. Now, about this pendant that I have been admiring forever- I envision it in a room with blue walls. Divine! The heels are just daring and hot and could modernize any old LBD to trendsetter status. And the bag? This little number certainly packs a lot of punch and is so versatile with its beautiful color combination. So, what do you say? Is this Red-ish color for you? Love the shoes and bag! Wish my feet were 20 years younger! Your 'affordable' series sounds great. Have a good day! I have always stayed away from red, but I don't know why! those heels would be amazing with a LBD. great find! 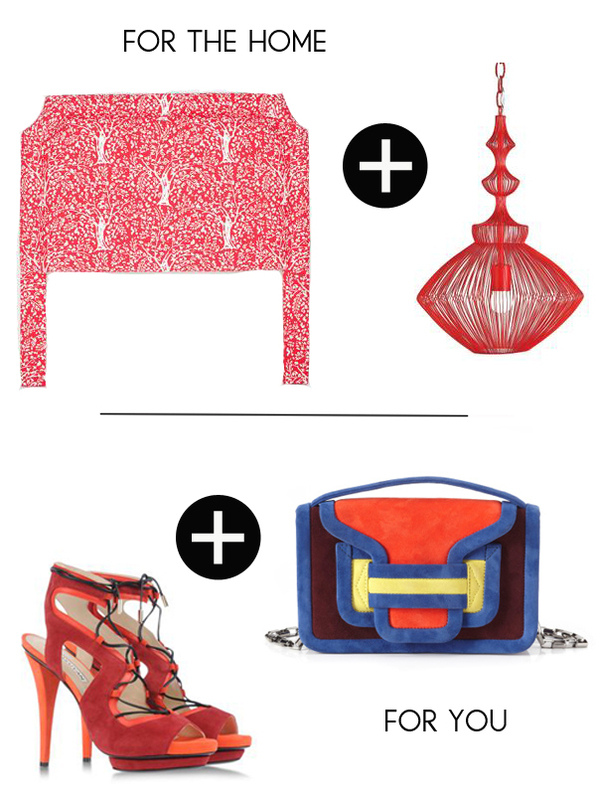 I love that headboard adds a whimsical feeling too and loving red when it is colorblocked - that bag is fabulous! oooh love all of these picks - would love to have a beautiful fun headboard like this one! I love the headboard, and that pendant. Gorgeous! What a fun headboard! Lovely picks! Love the headboard- it's even better in person! Biscuit Home has it in their store and it's swoon-worthy. I like the burnt orange color.... I think the bag might be a little tough to style for me... It's hard for my head to wrap around patterns and colors sometimes... maybe just a LBD!? I kind of love all 4 items wayyy too much! Great picks! I love the headboard, well really all of it! The reddish color is beautiful and happy, but I can't use it in my house. Anything that goes warm isn't my friend. I love a blue red. Can someone tell me why beautiful things are always so expensive ...?! Lord help me. The shoes, the pendant. I die. Love em. I'm usually not a fan of red, but these are so appealing. The chandelier is the one calling my name. Fab home combo! I want that light very-bad!! The bag. Oh the bag! I am not going to be able to rest until it is in my clutches!